So, the holidays have come, and almost gone and, more importantly, we survived them. The gift that my son wanted to badly did arrive and the look on his face when he opened it was priceless. Just priceless. See, my husband pulled one out of a hat with that one and didn’t even tell me until the Gold Passenger Polar Express Car arrived in the mail a day before Christmas. It was a Hail Mary. I don’t even know how much my husband paid for it, and it doesn’t matter. In that moment, it could have cost our life savings, and it would have been worth it. The look on J’s face was what still believing looks like to a child. 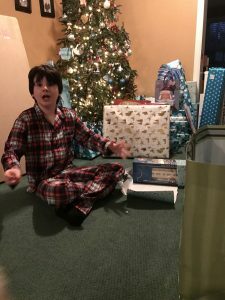 Would I like my son to realize other lessons of the true meaning of the season? Sure. But he did make sure he brought in a toy for the toy drive at school. He did do that. So, he gets the giving part (sort of). But, that is something not easily understood by kids like him, on the spectrum. If J saw a kid who was in need, he would feel empathy and compassion and ask questions as to why they were sad but the abstract idea of there being kids out in the world with less than him is a very difficult one to understand. It’s not really tangible, is it? It’s not in his world, something that he sees and bear witness to on a regular basis. He has seen less fortunate kids in movies (even in the beloved Polar Express!). He has seen homelessness in New York City. He has seen it, but he has not lived it. In J’s mind the world is a good, happy place. Yes, he has disappointments and setbacks personally, but he mostly feels that those things only happen to him. As a matter of fact, this is something we are working on with him: the idea that bad things don’t only happen to him and that he is not the only one with, what he calls, “bad luck”. Everyone has good days and bad days. Everyone has setbacks. Everyone feels angry or sad or frustrated at times but the victory comes when we face it, and move forward. The satisfaction is found in OVERCOMING them. Again, a difficult concept. It is not immediately felt or earned. There is a process to improving ones own perspective. It doesn’t come easily for neurotypical kids, or adults, but for a kid on the spectrum it can feel like an impossibility. This is where that “fight or flight” response kicks in, I believe. It’s easier to just not try than to try and not feel better right away, to not get that immediate satisfaction that you need. A life lesson at a very hard time. 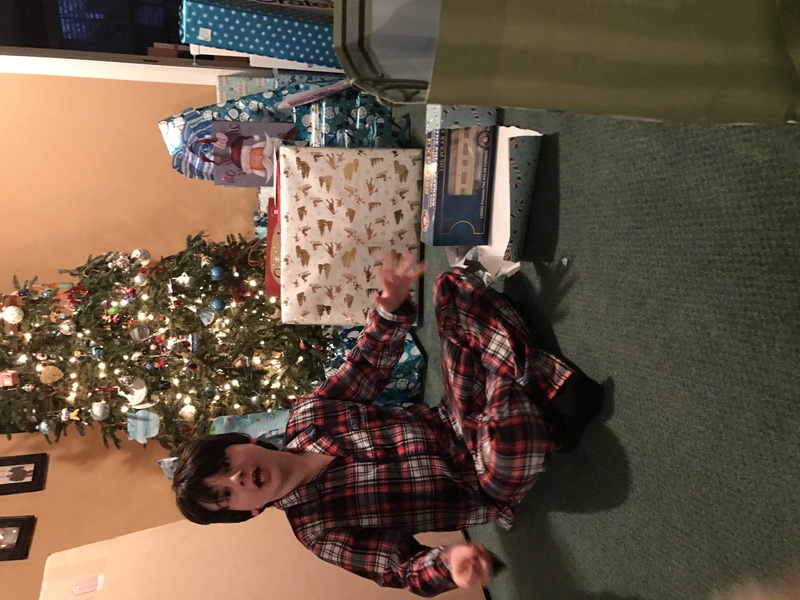 The instant gratification of the season breathing down our necks as my husband and I prepared ourselves mentally for the fact that J may not be happy on Christmas morning was almost too much to bear. We both barely slept the night before worrying about whether or not this would be considered a good Christmas or not. We sat with baited breath as J opened each and every gift (and there were A LOT of them), exhaling just a little after each one. Until the moment that he opened up that gold train car…. Do you know what this looks says? We sure are screwed if he ever finds out the truth about Santa, aren’t we? ?